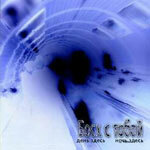 BOSCH’S WITH YOU were a Russian instrumental rock band, formed in Moscow in 2004. Conceived initially as a solo-project of Dima T. Pilot (April 13, 1980 - May 07, 2009), guitarist and founder of the noise-rock band PILOTS UP IN SMOKE (active from 1999 through 2006), that project soon grew into a four-piece band know for its charming and intriguing stage performances. From 2004 through 2009, BOSCH’S WITH YOU produced 8 albums in total including vinyl-only LP for the US-based KNVBI Records and 3”EP for Chat Blanc Records from Canada. In their years, BWY went through several personnel changes, though the creative core of guitarists Dima T. Pilot and Andrei B. remained relevant and meaningful. Since 2006, Dima T. Pilot and Andrei B. have been also teaming up with keyboardist Nick Zavriev under the name LIGHT UNDER WATER. This album is the ultimate collection of studio compositions created by LIGHT UNDER WATER (Dima T. Pilot, Nick Zavriev, and A.B.) from 2006 through 2009. It includes the "Sky Noise Temperature" unpublished album in its entirety as well as new compositions which were finished just a month before Dima's tragic death. 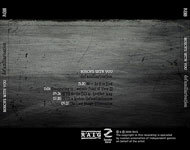 All tracks were produced by Karl & Dima T. Pilot at the Pri-Zvuk Studio in Moscow. 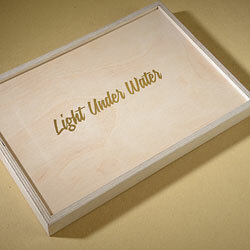 The album is presented as strictly limited, collectable “The Lost Artist’s Set”: 50 handcrafted units that come in oversized wooden boxes (12.2 x 8.2 x 1.2”; shipping Weight 2.2 pounds). Each box contains: CD (8 tracks - 78 min.) housed in full-colored 24-page digibook, 34-page hardcover coloring album and special 8-color pencil-set. Art-concept, design, and original graphics by ZonderZond. Free streaming or immediate digital download of the album is available through Official R.A.I.G. Bandcamp. The Double Disc-Set edition of the album (100-ltd pieces) includes the "Live In Kharkiv" album which is not available as a single disc. It was recorded at the Churchill Pub in Kharkiv, Ukraine on April 26, 2008; mixed and edited by Karl at Pri-Zvuk Studio in Moscow in summer 2009. (4 tracks - 48 min.). 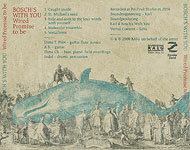 "The studio swansong from the brilliant experimental / post-rock Russian band Bosch's With You. 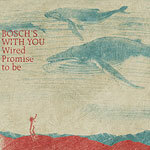 This release entitled Wired Promise To Be is unfortunately a bitter sweet one as it contains the final performances of Bosch leader Dima T. Pilot who passed away unexpectedly just after these recordings were completed in the spring of 2009. I'll be damned if this all instrumental effort didn't reach right in and grab a hold of my heart strings straight from the onset. The absolutely gorgeous and layered guitar melodies of the first track 'Caught Inside' immediately enthralled me as the composition slowly unfolded in a swirling haze of dual guitar interplay between Pilot and second guitarist A.B. No sooner had the final notes died out before the next richly textured gem 'St. Michael's Seed' was quickly upon me. If there's one thing that I've always admired about this quartet it's their unique ability to construct mystical, aural landscapes that root themselves deep into the listener's imagination. What also stands out is just how beautifully their songs flow into one another with such transparency. Their soaring melodies and catchy hooks for example on the nineteen minute show stopper 'Hide and Seek To The Four Winds With Yourself' is so engaging you'll lose all track of time and space. The same can be said for the closing track 'Metathesis' which is a sprawling and ever shifting twenty two minute epic that features more of those rich sounding, melancholic guitar atmospherics, only this time it's coupled with sparse flute textures and the odd bit of field recordings, which further expand the established ethereal qualities of this track. Even though Wired Promise To Be effectively closes the chapter on what had to be one of Russia's most highly regarded acts on the independent scene, they leave us with no less than seventy glorious minutes containing some of the most thought provoking and ultimately, treasured music of their entire career. Although this album obviously wasn't originally intended to be a tribute to Dima T. Pilot, in the wake of his death it's difficult not to view it in this light. In that regard the wealth of music he left behind will never die, it will continue to inspire and honor the spirit of its creator. (Score: 5/5)" – by Ryan Sparks at Sea Of Tranquility (USA) (January 2010). 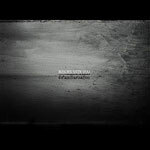 "When I first encountered this Russian band a few years ago, they were a promising instrumental post rock band who had enough know-how to keep their songs gripping throughout their generous lengths. Their previous CD saw the quartet not only considerately matured, but also finally setting themselves apart from the American post rock sound. On this unfortunately last record, they fine-tuned their style into something rather unique... The whole album works as an entity of mind-blowing ambient post rock performed by one of the few bands that managed to find their own stylistic corner. Bosch’s With You have possibly never had mass appeal, but their intensely beautiful music will continue to haunt us for many years to come. Dima T. Pilot may no longer be among us, but his genial body of work makes sure that he will never be forgotten! 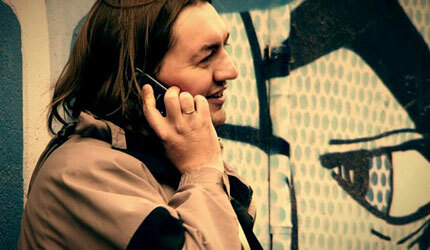 (Grade: 9/10)" – by Pascal Thiel at DisAgreement (Luxembourg) (February 2010). "A promise that will forever remain to be... Throughout the whole album a dreamy, sad beauty flows endlessly through the music. Be it within the soft and slow atmospheric tracks or the rocking, dynamic, energetic ones. The ringing notes played by the guitars left hanging in the air, suspended in the fog driven up by sounds and noises from various sources, including field recordings, the static yet lively rhythm section giving the music a fundament to rely on. All these parts work together to create a living, breathing sound that seems to flow endlessly. At times very subtle and almost ephemeral, at other times working towards an explosion of rock music. But even these explosions are gentle and focused, if you compare them to heavy 21st century prog bands like Red Sparrowes, which indeed shows where Dima T. Pilot comes from... What a common place it is to say that some kinds of music really take you away on to a journey to your subconscious or to the forgotten dreams you had, but here even I would take it and use it. Because it fits, plain and simple... This final record of Bosch’s With You is a tender to the idea that some things last longer than death and that some are even eternal. It is the great fortune of an artist to create something that will outlast him. 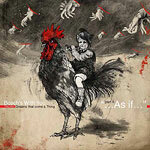 Bosch’s With You leaves behind about half a dozen albums with rising artistic relevance and impact. No need to light candles now or fall into prayer, but listening to 'wired promise to be' just might tip the balance of energy in the universe to the better side, even if just for a little." – by Georg Gartlgruber at Monochrom-Cracked (Austria) (April 2010). The album was also reviewed at: Metal Library (Russia), AerialSounds (Russia), Music Waves (France), Progressive Area (France), Psychotropic Zone (Finland), Neformat (Ukraine), Eurock (USA). "Dreams That Come A Thing has BWY matured and more varied than in the past... Outstanding! (Grade: 9/10)" – by Pascal Thiel at DisAgreement (Luxembourg) (February 2008). "To pigeonhole or call BWY experimental or avant-garde ultimately doesn’t do the music justice because the music on Dreams That Come A Thing will ultimately speak to listeners that possess an open mind, and who are willing to invest an hour of their time to really listen to the music. The rewards offered are certainly worth it in the end. 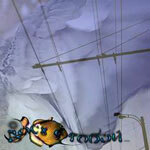 (Score: 4,5/5)" – by Ryan Sparks at Sea Of Tranquility (USA) (April 2008). "It's hard to believe that these guys aren't gigantic and being buzzed about by everyone that's into the whole instrumental rock sound... They pack their compositions with heavily layered melodies and instrumentation and paint huge vistas of brooding sound out of chiming guitars, subtle washes of samples and electronic noise, slow, propulsive but very minimalistic drumming that sometimes locks in with a second drummer that breaks out the occasional tribal tom tom beats, and piano... This becomes a new chapter in Bosch's evolving soundtrack rock, and all together makes for my favorite music from the band yet. Fans of stuff like Red Sparowes, Sigur Ros, and Grails should definitely check 'em out as well." – by Adam Wright at Crucial Blast (USA) (May 2008). The album was also reviewed at: Monochrom-Cracked (Austria), Sonic Frontiers (USA), The Silent Ballet (USA), Rolling Stone (Russia), ProgArchives (USA), Progressive Area (France). "Instrumental post rock fans will find much to revel in these psychedelic ambient soundscapes that combine effortlessly driving guitar moments with pastoral beauty. (Grade: 8/10)" – by Pascal Thiel at DisAgreement (Luxembourg) (December 2006). "One gorgeous hour of cascading, delayed powerchords and dreamy melodies... The band sends up billowing clouds of guitar drone and cosmic metallic ambience that curl around a series of beautiful moody interlocking guitar melodies, and interjects noisier, distorted riffing and really spacey, hypnotic drone improvisations... Their epic instrumental rock certainly hits the right spots, sounding like a combination of the mellower parts of Isis songs, Explosions In The Sky, and My Bloody Valentine's wall of sugary guitar roar, stretched out into floating dream sagas. Fans of UK ambient tone sculptors Rothko might also dig Defamiliarisation's swirly, pastoral beauty." – by Adam Wright at Crucial Blast (USA) (January 2007). The album was also reviewed at: Psychotropic Zone (Finland), Rovesnik (Russia), Rolling Stone (Russia), Aural Innovations (USA), The Silent Ballet (USA), DPRP (UK), Space Rock UK (UK), ProgArchives (USA).